Morgan Luttig is an experienced choral director, general music teacher, musical director, vocalist, and pianist. She is the Visiting Choral Director and Visiting Instructor of Music at Washington and Lee University for the 2018-2019 academic year. Morgan has a Master of Music Education - Choral Emphasis degree from Westminster Choir College. Prior to graduate school, she was the Choral Director and General Music Teacher for Preschool through 12th grade at St. Andrew's School in Savannah, Georgia. She has a Bachelor of Arts in Music degree from Washington and Lee University, as well as her K-12 vocal and instrumental teaching certification. Morgan sang with Westminster Kantorei, Westminster Symphonic Choir, Westminster Jubilee Singers, and Westminster Master Singers while completing her masters degree. In addition, she acted as a Conducting Fellow for the Princeton Girlchoir and Princeton Boychoir, as well as Associate Conductor for the Westminster Neighborhood Children's Choir. For her Graduate Assistantship in Music Education, Morgan was the 6th Grade General Music Teacher at John Witherspoon Middle School. While teaching in Savannah, Morgan participated in numerous choral ensembles such as the Savannah Philharmonic Chorus, iCantori Choral Ensemble, and the First Presbyterian Church of Savannah Chancel Choir. She also served as Assistant Artistic Director for RISE Chorales, a community choral group that seeks to "Revolutionize and Inspire Singing Excellence" among local middle school and high school students. She was selected to be a Conducting Fellow for the Savannah Children's Choir during her second year of teaching. Morgan directed seven choral ensembles at St. Andrew’s School ranging from 3rd through 12th grade, in addition to teaching Pre-K3, Kindergarten, and 2nd Grade general music. Morgan has led a private piano studio, and worked as music director for the Savannah Children’s Theatre. She is a part of the National Association for Music Educators (NAfME), Organization of American Kodály Educators (OAKE), Chorus America, and the American Choral Directors Association (ACDA), where she is the 2018 Southern Region Children's Honor Choir Coordinator, served as Co-Coordinator of the 2017 National Children’s Honor Choir, and was Assistant Coordinator of the 2016 Southern Division Treble Honor Choir. 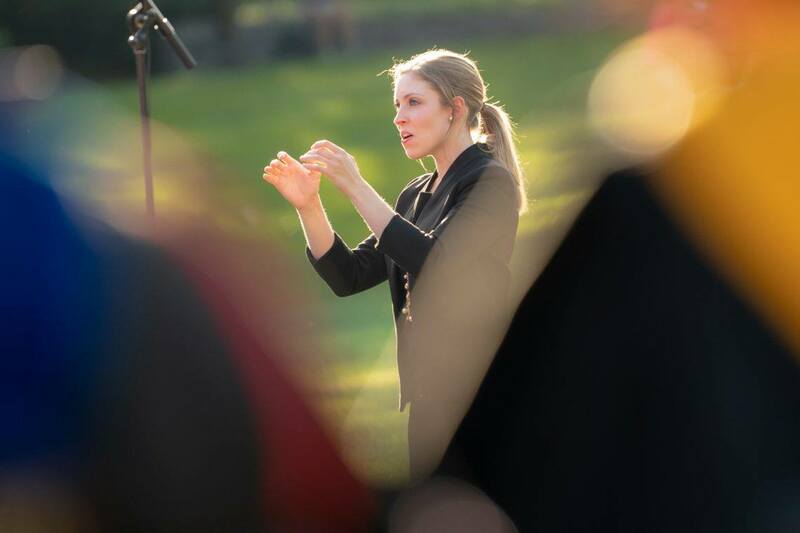 As an undergraduate, Morgan was the assistant conductor for the three choral ensembles at Washington and Lee and acted as president of the University Singers in her senior year of college. She also participated in multiple instrumental ensembles, performed as the lead in the school operetta, and was music director for an a cappella group on campus. Morgan is a composer and arranger, writing works for middle school, high school and collegiate ensembles. She was inspired to become a teacher by former educators that went above and beyond to make learning exciting every day. Her choral ensembles are known for having vocal energy and perseverance.